And flashlight last night we read four great books, My honey, J and I all crowded on the love seat, and read Half a pig by Allen Ahlberg, The Lonely Moose by John Segal, How Mommy met Daddy by Katharina Grossmann-Hensel and The Perfect Bear by Gillian Shields and Gary Blythe, all picked from our local library! Half a pig was interesting but long! The Lonely Moose is a quick, sweet tale about friendship. How mommy met daddy is odd on the last page but the idea is how two very different people can come together and become, through love, a better version of yourself. 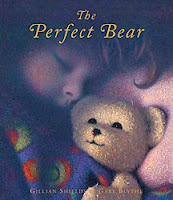 The Perfect Bear took our collective breath away with the amazing illustrations, which had an antique quality and really bring the Velveteen rabbit-like tale t o life! The expressions on the tiny face of the "do not touch bear" were so true and real. All four of these books will be added to my to-buy list for school, especially the bear book. It's not easy reading by a flashlight held by a wiggly 6-year-old!! Thank heavans we are not pretending to be pioneers for the long term. Family decision last night though was we should spend every Saturday using minimal electricity...getting snuggy on the love seat was a positive experience. We'll see what the teenager has to say about this new family development as he was at a sleep-over! !